It was with a quiet confidence that the Monarchs went into their game against Harrow at home following 5 wins in a row. Home this time being Braywick with the sloping off side!! 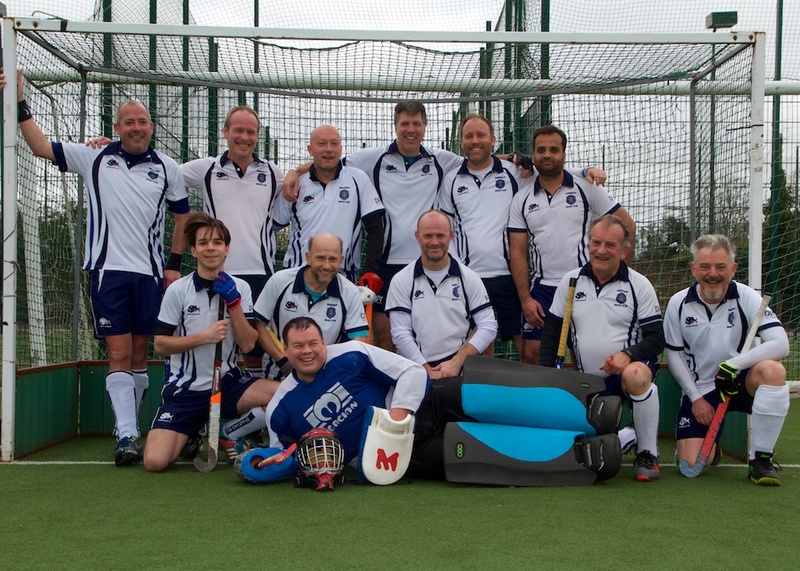 Maidenhead believed they could win this match as the first outing against Harrow was not a true reflection of the Monarchs capabilities. Monarchs pushed back and were immediately on the attack which was quickly turned around by a Harrow intercept. The Monarchs attacked again in return with good runs made by Viren, JC and James in the middle, well supported by Colin, Ash and Gavin on the wings with Tim, Rod and Clint up front. On this occasion the ball was played into the opposition D and picked up by Viren who slipped the ball to Tim for the first goal of the match, 1-0. Harrow then took the attack to Maidenhead and some slick passing got the ball into the D where they tried to put the shot past Sean who managed to get a glove to it but not enough. The ball rolled past Sean and a galloping Randy was beaten by the awkward speed of the ball as he tried vainly to drag it off the goal line, scores were now level 1-1. Maidenhead Monarchs regrouped and after some very quick and fairly accurate passes across the pitch were inside the oppositions D where they managed to get a short corner. Viren received from JC, and his shot was saved but the follow up was put to the far post and intercepted by Rod who scored to make it 2-1. Harrow then had the run of play for the next few minutes with some good hockey as Maidenhead failed to take advantage of the 50/50 ball. It was during one of the Harrow forays into the Maidenhead D that Sean pulled of a blinding save from a well-timed Harrow shot which flew high and fast over the surrounding fence. This long corner led to short corner which was quite well worked by the opposition who capitalised on a loose ball and managed to get their second attempt past Sean et al, 2-2. However after this second goal, solid defence by Paul, Randy and Nick allowed the ball to reach the Maidenhead mid field of James, Viren and JC who moved it quickly to the forwards, Clint and Tim who unfortunately failed to convert a couple of good opportunities apiece. The second half saw the Monarchs start well and were matching the opposition for possession of the 50/50 ball and passes were finding players and not being intercepted. It wasn’t long before the opposition got the better of the Monarchs defence and put a well worked goal past Sean to take the score to 2-3. The Monarchs picked up the pace for the following 5 minutes and were again rewarded with a well worked goal from Gavin, who received a ball played out of the D by the Harrow keeper and he pushed it back into the D. the pitch was quite bumpy and the keeper was beaten by the uncertain bounce of the ball, 3-3. Harrow gathered momentum and pushed the game up the pitch and tested the Monarchs defence again but the ball went wide. Paul took the 16 hit and noticed that Clint was being marked quite high and put an aerial ball into the opposition half, unfortunately Clint was beaten in the sprint to the ball by a more youthful Harrow player. The Monarchs sensing a resurgence from the opposition upped their game and worked the ball into the top right corner of the 23 yard area, the ball was slipped to Clint by Rod who found Ash wide open. Ash seemed a little surprised to have received such a perfectly placed ball but unfortunately with the keeper wrong footed, put the ball wide of the goals. After more determined play the opposition were again the Maidenhead D where another fantastic save by Sean saw the ball go wide of the goals. The resulting long corner saw Randy play the ball off the goal line and the ball was worked up the field where Colin put the ball into the D and Clint found a defenders foot for a short corner. Ash received the ball from JC and with a very well time shot, put the ball past the keeper and the defender to take the score to 4-3. The flow of the match then went against the Monarchs when Aylesbury broke down their left wing. The resulting melee ensured that Harrow were awarded a short corner which was well taken and this time the first shot was blocked by Paul but he was adjudged to have fouled the opposition striker. Short corner again and again Sean saved the first shot on goal, the follow up was stuck hard and high at James, who played a cover drive the current English cricket team would have been proud of, to clear the ball out of the goal to Gavin on the right wing who played the ball up the side-line for another Maidenhead attacked which was only cut short by the final whistle. There was a sense of achievement at the final whistle as the game had been a hard fought one with no discernible mismatch of skills, ability or stamina which plagued the first meeting. It’s been a good start to the second half of the season for the Monarchs, but we are under no illusion that the matches are going to get tougher from here on in. There were a number of chances missed from the likes of Clint who put one wide of the posts and from Tim and Viren whose shots were saved by the keeper. Today’s win was a very well worked team effort from all on the pitch.